Thousands of Mitchell-Lama apartments in New York City -- created by a wonderfully successful NYS middle-income housing program-- are facing extinction. If the owners are threatening to take your building out of the Mitchell-Lama program, read (and download) the Buyout Handbook in English (2011), Spanish (2008). Then click on "read more" below for what happens in a "buyout." This website primarily concerns rentals. 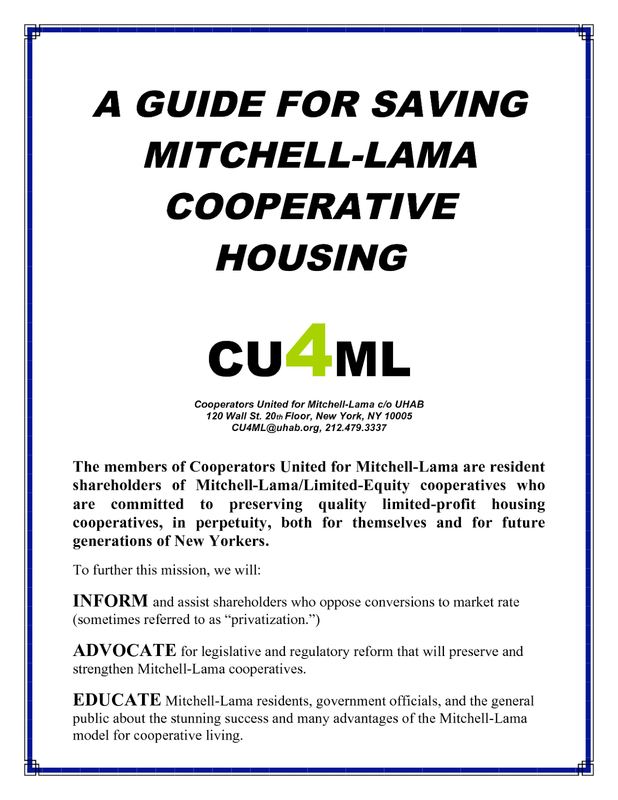 If you want to keep your Mitchell-Lama co-op in the program, contact Cooperators United for Mitchell-Lama (CU4ML). The year your building was built makes a difference. Tenants in developments built before 1974 are protected if taken out of Mitchell-Lama. They go into rent stabilization. But tenants in developments built later have little protection unless the state law changes. FIND YOUR BUILDING , the year it was built, the "borough block and lot" numbers, and who represents you (updated Jan. 2018). My pre-1974 rental building is about to leave Mitchell-Lama. What can I expect? What are (or were) "unique or peculiar" (U or P) increases? My building, constructed after 1973, is about to leave Mitchell-lama. What can I expect? What are enhanced ("Sticky") vouchers? "Buying out" means the landlord is pre-paying the mortgage for a building in order to take it out of the Mitchell-Lama program. It does not mean that the tenants get paid any money. 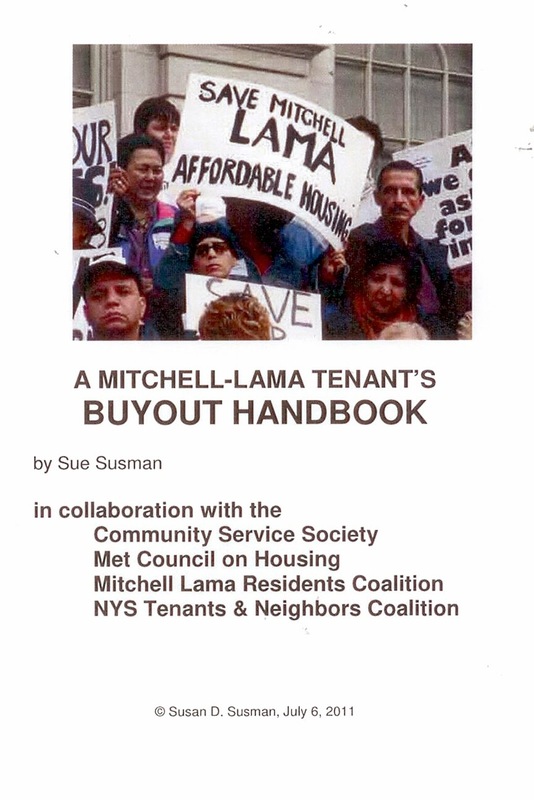 It's clearer to say "the owner is taking the building out of the Mitchell-Lama program" -- but the expressions "buyout" or "the landlord is buying out" are common on websites such as that of the NYS Division of Housing and Community Renewal. Aren't landlords entitled to buy out of Mitchell-Lama after 20 years? Yes but . . . the question is what happens to the people who live in those buildings. Most of us were never told that our apartment situations would change after 20 years or so. The landlords have not suffered: Having invested in many cases only 5% of the project's cost, they were given low-interest mortgage, tax breaks, and guaranteed 6% profit (in most cases more) on their investment. Affordable housing is a necessity in New York City if the city is to function: we are the people who staff the city's schools, libraries, hospitals, transit system, social-work centers, theaters, and music and art programs. The City and State made the decision that having middle income housing is crucial -- and that is no less true now than it was in 1955 when Mitchell and Lama proposed their bill to the New York State Legislature. So to answer a question with a question: Is the City's need for affordable housing outweighed by a landlord's "need" to make more than 6% profit (and management fees) on land that was virtually donated when the buildings were erected? Can the tenants here buy our building to save it? 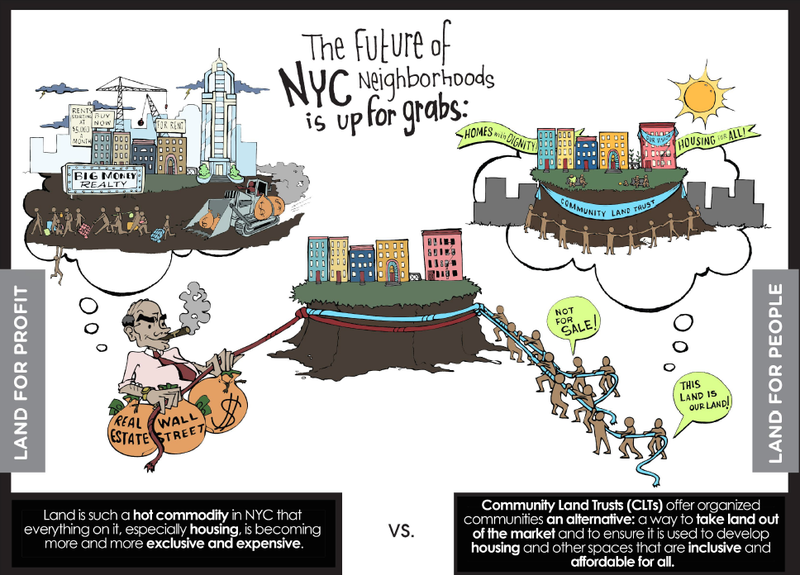 NYC's Housing Development Corporation (HDC) may let the tenants, the owner, a third party, or some combination of those, convert their rental building to an affordable co-op, if at least 25% (preferably more!) agree. Or a Community Land Trust or group such as the Urban Homesteading Assistance Board (UHAB) may help the tenants buy it. But there is no requirement that the owner permit the tenants to buy it. More importantly, private equity firms are engaging in "predatory equity" -- buying buildings as investments. They promise their investors far higher returns than most landlords make -- returns only possible if all the rent-regulated tenants are forced out. So some owners are not interested in selling their building to the tenants even if the tenants offer them more money than some predatory equity company -- particularly if the landlord has invested in that company! What happens to our rents if the landlord takes us out of Mitchell-Lama? If the building was built before 1974, it goes into rent stabilization. Rents are regulated by the state under the rules described on the NYC Rent Guidelines Board website. In Mitchell-Lama Co-ops, “buying out” means pre-paying the mortgage and leaving affordability and tax breaks. given at low cost to developers to build either rental or co-op buildings that would be and stay affordable to low- and middle-income residents. The developers were also given low-interest government-subsidized mortgages. To keep the developments affordable, the owners were given tax abatements. The apartments must be managed according to the state's Private Housing Finance Law, and is supervised by an agency representing the level of government that subsidized the mortgage: city (Department of Housing Preservation and Development); state (NYS Homes and Community Renewal’s Division of Housing & Community Renewal or DHCR); and federal (Department of Housing and Urban Development). · they cannot mortgage their individual apartment. Instead, there is a waiting list, maintained by the supervising agency (HPD, DHCR, and in some cases HUD), and expenditures must be in keeping with the affordability requirements of state law. Residents who meet the financial qualifications buy their apartment for a fixed, low cost, and later can sell it for roughly the same amount - so there is no profit involved and the apartment remains affordable for the next buyer. Why shouldn't residents take the co-op building out of Mitchell-Lama? 1. The cost goes up for those living there. When a co-op is taken out of Mitchell-Lama, it loses its tax abatements and must pre-pay its government-subsidized mortgage. That generally means taking out another mortgage, often at higher cost. With new tax bills to pay and possibly higher mortgage costs, the costs of running the building increase - and that means higher monthly maintenance costs for residents. In addition, those residents who hope to sell their apartments for lots of money may want the building to look nicer, and may push for cosmetic and other "improvements" whose costs will be shared among all the building's residents. The purpose of Mitchell-Lamas, set out in Article II of the Private Housing Finance Law, is to provide affordable homeownership to "persons or families of low income." Mitchell-Lamas - both rentals and co-ops - are technically non-profit corporations set up to make that purpose a reality. In co-ops, middle-income people buy shares (so they become "shareholders") that allow them to live in a particular apartment. When they leave the apartment (or die), the "shareholder" is entitled to whatever they paid, plus the small increase in the value of the building resulting from paying off part or all of the mortgage. (Shareholders cannot sell their apartments to anyone, leave them to someone in their will, mortgage them, or otherwise earn a profit from them.) The next shareholder will be taken from the waiting list, supervised by the government agency of the level holding the mortgage. · City mortgage-held buildings are supervised by the city's Department of Housing Preservation & Development. · State mortgage-held buildings are supervised by the state's Division of Housing & Community Development. · Federal mortgage-held buildings are supervised by HUD. must pay off its government-subsidized mortgage and get another mortgage on the free market. More importantly for this discussion, privatization means changing the kind of corporation that is the legal form for the building. As the Cooperators United for Mitchell-Lama note, it is no longer a non-profit entity set up to "serve a public purpose." Instead it becomes a for-profit entity authorized to promote the private monetary interests of its shareholders, without any regard for those the Mitchell-Lama program intended to benefit. While the co-op building is in Mitchell-Lama, it is supervised by a government agency. The co-op board is legally required to operate the project "in the most economical manner" for the financial and physical integrity of the building, and the supervisory agency (HPD or DHCR) oversees this duty. But if a co-op leaves Mitchell-Lama, and becomes a "for profit" organization, HPD and DHCR no longer oversee the buildings, there are no more waiting lists of income-eligible applicants, and the new for-profit corporation gets complete control over these issues. *Thanks to Joan Meyler of CU4ML (Cooperators United for Mitchell-Lama) for articulating points 1, 2 and 3 in a letter to then-NYC Comptroller Thompson and Dept. of Finance Commissioner Stark . 4. The People Who Benefit Change. While the co-op is still in Mitchell-Lama, the supervising agencies make sure that affordable homes are available to the current shareholders (owners) and to the low- and middle-income people who qualify to be on the waiting list. But as soon as the co-op changes from Mitchell-Lama to a for-profit organization, there is no more waiting list, and no more concern for those who will need affordable housing in the future. Instead, the people who formerly had only the right to live there as long as they lived (but couldn't pass it on to others), would now own it outright, and could do what they wanted with it. All the public subsidies would go to enrich them privately. And public policy on issues like affordable housing for future generations would have no more effect. 5. Buildings can get the financial support they need (up to $15 million) interest free to make necessary repairs, so there is no need to privatize. The state's Housing Finance Administration and the City's Housing Development Corporation are offering loans (the HFA loans are interest-free for up to $15 million to state-supervised Mitchell-Lamas) to help buildings make necessary repairs and stay in Mitchell-Lama. See HFA's program, the Mitchell Lama Rehabilitation and Preservation" project.